Enclosed are my notes from the Foundation for Sarcoidosis Research (FSR) Chicago Patient Conference. While not comprehensive, it will give you a flavor of some of the highlights of the event. I tried my best to keep up with the presentations, but the doctors moved very quickly from slide to slide. I do not certify the accuracy of the items covered, but merely reported the comments to the best of my ability. I hope you will find this helpful. There are 3 summaries contained on this page. May 1, 2016: Dr. Wonder Drake – What is Sarcoidosis? Criteria used to make the diagnosis of Sarcoidosis: Why it takes a long time to make a diagnosis. Sarcoidosis does not present itself easily. Doctors don’t look for Sarcoidosis first. Clinical presentation is a process of elimination. The first step in the process is that we have to rule out other things. After we rule everything else out, we call it Sarcoidosis. With Sarcoidosis, sometimes the Chest X-Ray looks like a typical X-Ray. Because Sarcoidosis is rare, it can look like and be interpreted as a fungal infection – especially in areas where fungal infections are common. The type of sickness that you have. What your chest x ray looks like. What your tissue looks like under the microscope and if any microorganisms grow from your tissue. When symptoms occur, the first respiratory interpretations are often Histo fibrosis (fungal infections), Cancer, or TB (accounts for misdiagnosis or long diagnosis). Every time you breathe in air, you could be breathing in bacteria. When this happens, a collection of infection fighting cells can take over the air spaces in between cells and this lessens the right amount of gas that gets exchanged (resulting in patients getting short of oxygen). In Sarcoidosis patients, granulomas form when infection fighting immune cells can’t get out and go away. They band together and more immune cells come to join the fight. Dr. Drake likened this to a bench-clearing brawl with the referee in the middle (oxygen) cannot get out due to all the players (immune fighting cells) surrounding him. Dr. Drake presented data demonstrating the rising incidents of Sarcoidosis mortality and morbidity over the years. She reviewed findings delineating the contribution of genetics to Sarcoidosis’ clinical outcomes. I found this really interesting. There now appears to be a familial link in who can contract Sarcoidosis. That said, the chances are still relatively low – only 4-5% within the same family. She also discussed the results of immunologic inquiry of Sarcoidosis adaptive immunity and how this helps us identify new therapeutics (below) and presented new areas of investigation. Infection-fighting cells meet up and form granuloma. Then T-Cell comes in. Can’t kill the granuloma, but T cell keeps the disease in check. There are HLA protiens on infection-fighting cells that can aid healing. 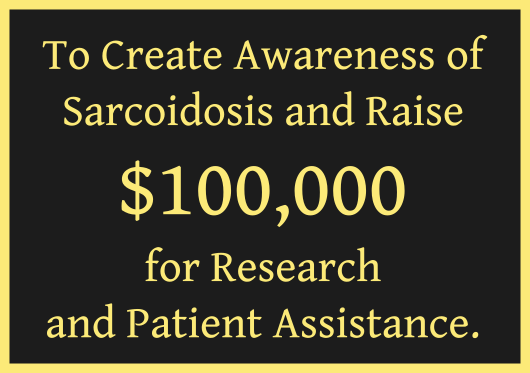 99% w/ this gene can resolve their Sarcoidosis in 2 years w/ no intervention. Race is not the most important factor anymore. How the Immune System resolves the disease. 90% of patient’s have Sarcoidosis indications in the spleen. Patients who exercise more feel less fatigue. Start Slowly and increase endurance over time. (I can testify to this). How well does your immune system work? The best news I heard all day was that several clinical trials investigating new treatments for sarcoidosis are underway. Dr. Nadera Sweiss added that it will be at least 2 years before we see published results. Dr.Drake is doing studies on a new drug that appears to work on cancer patients. It is not yet FDA-approved. Phase 1 trial showed improved breathing and got the NIH to fund a Phase 2 study. If you want to see all the clinical trials underway, go to ClinicalTrials.Gov and type in Sarcoidosis and you’ll see them all. Overall, I found Dr. Drake’s presentation to be “Wonder-ful.” I learned a lot and will read up on the CLEAR Phase 1 study. She’s doing amazing work.